Review: These days, RTS games are a common sight. Either you’ve played Warcraft, or Command & Conquer, or both. Hell, if you’re old school, you might even point to Dune: Battle for Arrakis, and call it the earliest example of an RTS. As new as it was, however, there was an even earlier example of RTS game, one that may very well have set the stage for games like Dune. It was a little known Genesis title called Herzog Zwei. The basic idea is the same as in any RTS: destroy the enemy’s base. The hook: you manage your side while simultaneously controlling a huge robot that transforms into a plane. Unfortunately, heavily armed though you maybe, you cannot even scratch the enemy’s base on your own, so you’ll need to build some units to help. They can actually hurt the enemy, but you’ll need to protect them from enemy forces, and the enemy’s own heavily-armed transformer. But that’s not all. Both you and your units have limited amounts of ammo and fuel, and once your units are out of one or both, they’ll be sitting ducks (whereas if you run out of fuel, you’ll simply explode). Unless you feel like sending your units on a long haul, you’ll want to conquer a few mini bases along the way to the enemy base to increase your cash flow and provide some pits stops for your transformer. The other hitch is that your units have to be programmed with specific commands like “stand and attack” and “take the base”, and the more complex the code, the more expensive it is to build the unit. Once the unit is out, though, you can always pick it up and reprogram it, provided you’re willing to shell out the extra cash. It was an entirely heard of concept at the time, and suffice to say, it didn’t go over too well with the critics. It didn’t go over well with me as a kid either, as all the orders you program your units with are given strange abbreviations, and I didn’t have the instruction manual. I wanted my infantrymen to capture the enemy base, what the hell is “AT-101H”? On the upshot, the CPU lacked any considerable AI, and so the developers sought to offset this by giving the CPU more units at the start of the battle, depending on the difficulty. It seems like a bit of a raw deal, but once you take care of those extra units, the CPU runs the same game on D difficulty that it does on A. The other bit that was either a hassle or a boon, depending on how you look at it, was the split screen setup for multiplayer. On the one hand, it allowed you to keep tabs on the other player. Unfortunately, the opposite was also true, and so it’s hard to setup any sneak attacks, what with the other player watching your every move. Of course, you don’t really need sneak attacks to outwit the CPU, but a human player can be a wily foe indeed. Battles can get a little long, particularly in multiplayer. Luckily, the game sports a pretty rockin’ soundtrack for a game of its time. The sound effects, on the other hand, leave a little to be desired. For the most part, they’re pretty innocuous, but the SOS alarm that sounds whenever your base is under attack can get quite annoying, especially given how long it takes to actually destroy a base. It’s worth mentioning that though the game was spurned when it first came out for being too complex, it’s now considered one of the best made for the console. That said, why not put aside your shooters and beat-‘em-up games for a minute and give this early RTS a try? I promise it’s not too hard. Woah, sounds a lot like Total Annihilation! 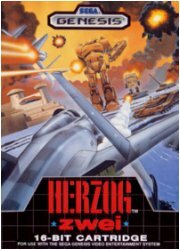 I bet having a name like "Herzog Zwei" didn't help much either. This is one of those games I meant to try out, but never did. I KNEW I had heard that name before. Sounds really awesome. You think Nintendo would put it out on Virtual Console? Maybe they're waiting to release it so that it will coincide with Herzog Drei? My brother had this game and I hated, Hated, HATED it. I totally sucked and lost every battle. Now that I've had experience with C&C and whatnot I should probably give it another shot. Thanks for reminding me that it exists! I thought Populus was the first RTS? I cant remember what system it was for though. Old school. Populus was out on PC and AMI in '89. Herzog Zwei in '88. Ya got me. Fun fact though, Japan didnt get this game untill '89! We actually got a game first!